Peerless Pressure Washing and Roof Cleaning Inc. Brandon Florida call 813-230-5915 for residential and commercial services. At Peerless Roof Cleaning Brandon Fl we utilize the newest and safest techniques to keep your roof and the exterior of your home and pool area free of mold and dirt. Our process removes roof stains with a minimal walking detergent application. Our company owner is a licensed Hillsborough County Painting Contractor, we have been back-ground checked and tested in our field and our company keeps current legal documents with the county. With the addition of our dedicated chemical pump, we have commercial grade washers that are strong enough to get rid of those cobwebs and bee nests. Utilizing the two, we can effectively clean the surface with the minimal use of pressure; thus, brightening the paint while keeping it where it is supposed to be! We restore brick, stucco, all painted surfaces and siding to like new without the use of damaging high pressure. Pool enclosure and decking services offered utilizing soft spray soap wash. Pool enclosure screens are cleaned with proper soaps and minimal pressure ensuring the integrity of your screens. Cool decking and river rock chemical washing services are also offered without the use of high pressure surface cleaning, typically used for concrete surfaces. Why should you choose Peerless Roof Cleaners? 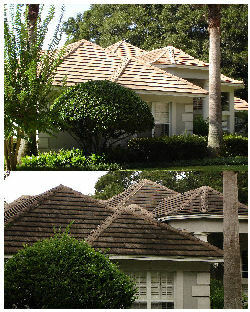 Peerless Roof Cleaning Brandon FL strives to be the area’s leading service. 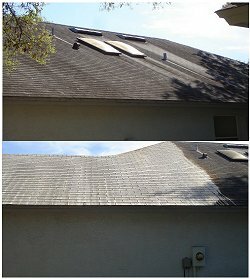 We have provided the Brandon FL area with roof cleaning services for ten years. Many Tampa, Brandon, Valrico, and Temple Terrace Area Roofing Contractors, Homeowners Associations, Painting Contractors, and Property Managers highly recommend our services. Our non pressure chemical roof cleaning methods are the safest for your asphalt shingle, or tile roof and our methods are fully approved by shingle manufacturers and roofing contractors. Our low pressure chemical roof cleaning systems kill, and safely remove algae, mold, and mildew that is discoloring your roof. Our cleaning methods comply with the Asphalt Roofing Manufacturers Association Guidelines for safe low pressure shingle roof cleaning. We are licensed and insured and guarantee our work in writing. No job is too big or small for Peerless Pressure Washing and Roof Cleaning of Brandon Florida, Inc.